Dur-Sharrukin ("Fortress of Sargon"; Arabic: دور شروكين‎‎), present day Khorsabad, was the Assyrian capital in the time of Sargon II of Assyria. 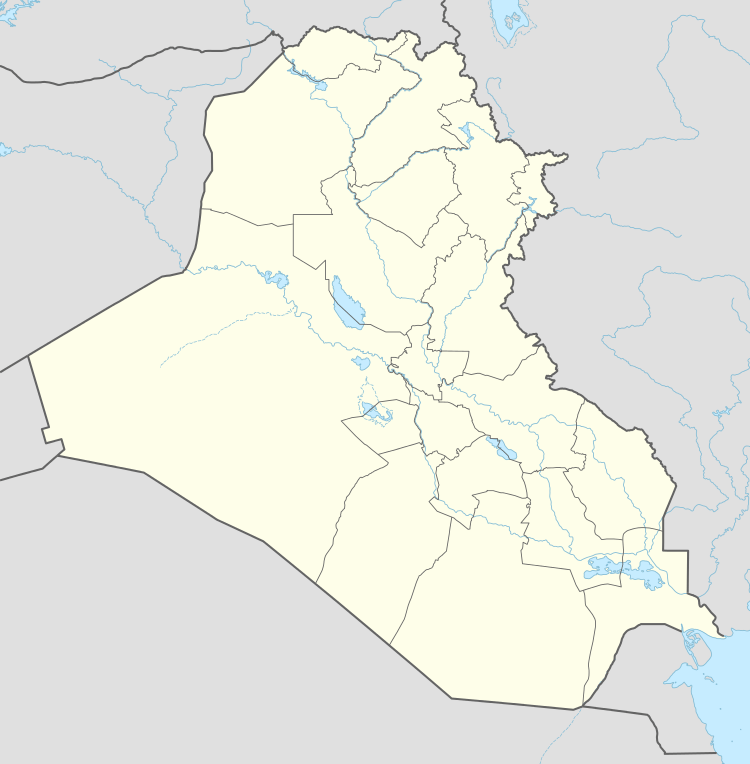 Khorsabad is a village in northern Iraq, 15 km northeast of Mosul. The great city was entirely built in the decade preceding 706 BC. After the unexpected death of Sargon in battle, the capital was shifted 20 km south to Nineveh. On 8 March 2015 the Islamic State of Iraq and the Levant reportedly started the plunder and demolition of Dur-Sharrukin, according to the Kurdish official from Mosul Saeed Mamuzini. The Iraqi Tourism and Antiquities Ministry launched the related investigation on the same day. The town was of rectangular layout and measured 1758.6 by 1635 metres. 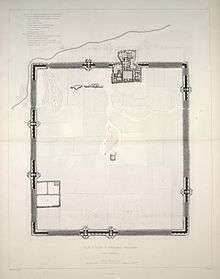 The enclosed area comprised 3 square kilometres, or 288 hectares. 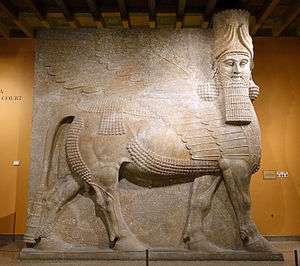 The length of the walls was 16280 Assyrian units, which corresponded to the numerical value of Sargon's name. The city walls were massive and 157 towers protected its sides. Seven gates entered the city from all directions. A walled terrace contained temples and the royal palace. 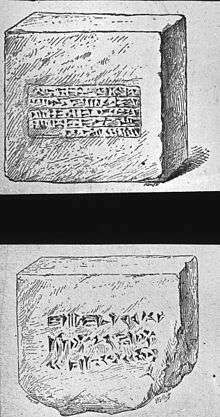 The main temples were dedicated to the gods Nabu, Shamash and Sin, while Adad, Ningal and Ninurta had smaller shrines. A temple tower, ziqqurat, was also constructed. The palace was adorned with sculptures and wall reliefs, and the gates were flanked with winged-bull shedu statues weighing up to 40 tons. Sargon supposedly lost at least one of these winged bulls in the river. In addition to the great city, there was a royal hunting park and a garden that included "all the aromatic plants of Hatti and the fruit-trees of every mountain", a "record of power and conquest", as Robin Lane Fox has observed. Surviving correspondence mentions the moving of thousands of young fruit trees, quinces, almonds, apples and medlars. "On the central canal of Sargon's garden stood a pillared pleasure-pavilion which looked up to a great topographic creation: a man-made Garden Mound. This Mound was planted with cedars and cypresses and was modelled after a foreign landscape, the Amanus mountains in north Syria, which had so amazed the Assyrian kings. In their flat palace-gardens they built a replica of what they had encountered." The site was first noticed by the French Consul General at Mosul, Paul-Émile Botta in 1842. Botta believed, however, that Khorsabad was the site of biblical Nineveh. The site was excavated by Botta in 1842-44, joined in the later stages by artist Eugène Flandin. Victor Place resumed the excavations from 1852 to 1855. A significant number of the items recovered by the French at Dur-Sharrukin were lost in two river shipping incidents. In 1853, Place attempted to move two 30-ton statues and other material to Paris from Khorsabad on a large boat and four rafts. All of the vessels except two of the rafts were scuttled by pirates. In 1855, Place and Jules Oppert attempted to transport the remaining finds from Dur-Sharrukin, as well as material from other sites being worked by the French, mainly Nimrud. Almost all of the collection, over 200 crates, was lost in the river. Surviving artifacts from this excavation were taken to the Louvre in Paris. The site of Khorsabad was excavated 1928–1935 by American archaeologists from the Oriental Institute in Chicago. Work in the first season was led by Edward Chiera and concentrated on the palace area. A colossal bull estimated to weigh 40 tons was uncovered outside the throne room. It was found split into three large fragments. The torso alone weighed about 20 tons. This was shipped to Chicago. The preparation and shipment of the bull back to the Oriental Institute was incredibly arduous. The remaining seasons were led by Gordon Loud and Hamilton Darby. Their work examined one of the city gates, continued work at the palace, and excavated extensively at the palace's temple complex. Since Dur-Sharrukin was a single-period site that was evacuated in an orderly manner after the death of Sargon II, few individual objects were found. The primary discoveries from Khorsabad shed light on Assyrian art and architecture. In 1957, archaeologists from the Iraqi Department Antiquities, led by Fuad Safar excavated at the site, uncovering the temple of Sibitti. ↑ Hatti: in this context, all the areas to the west of the Euphrates controlled by Neo-Hittite kingdoms. ↑ D.D. Luckenbill, Ancient Records of Assyria and Babylonia, vol II:242, quoted in Robin Lane Fox, Travelling Heroes in the Epic Age of Homer 2008, pp26f. ↑ Lane Fox 2008:27, noting D. Stronach, "The Garden as a political statement: some case-studies from the Near East in the first millennium BC", Bulletin of the Asia Institute 4 (1990:171-80). The garden mount first documented at Dur-Sharrukin was to have a long career in the history of gardening. ↑ F. Safar, "The Temple of Sibitti at Khorsabad", Sumer 13 (1957:219-21). Wikimedia Commons has media related to Dur-Sharrukin.